Father Edward M. Sipperly, Celebrant. ON THE FIRST FRIDAY of the month, provided no feast, ferial or octave takes precedence, it is permitted to say one solemn votive Mass of the Sacred Heart, using the Mass of the Feast of the Sacred Heart . . . and commemorating only a double of second class or greater ferial. Common imperata (prayers that an Ordinary may add to the Mass in his diocese) and prayers after Mass are omitted. The Profession of Faith is used in a sung Mass and omitted in a low Mass. The use of this solemn votive Mass requires that there be some devotion to the Sacred Heart, to be specified by the local bishop, performed in the forenoon. 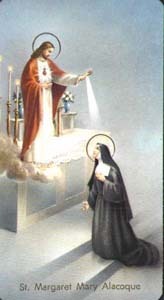 Appearing to St. Margaret Mary Alacoque, Our Lord asked that, in reparation for the ingratitude of men, He be honored for His love under the emblem of His human heart. He made twelve specific promises of reward for such honor. In parti­cular, "To those who will go to Communion on the First Friday of the month, during nine consecutive months, I prom­ise the grace of final perseverance." I will establish peace in their houses. I will be their strength during life and above all during death. I will bestow a large blessing upon all their undertakings. Sinners shall find in My Heart the source and the infinite ocean of mercy. Tepid souls shall grow fervent. I promise you in the excessive mercy of My Heart that My all-powerful love will grant to all those who communicate on the First Friday in nine consecutive months the grace of final penitence; they shall not die in My disgrace nor without receiving their Sacraments; My Divine Heart shall be their safe refuge in this last moment. "The sacred heart of Christ is an inexhaustible fountain and its sole desire is to pour itself out into the hearts of the humble so as to free them and prepare them to lead lives according to his good pleasure. "From this divine heart three streams flow endlessly. The first is the stream of mercy for sinners; it pours into their hearts sentiments of contrition and repentance. The second is the stream of charity which helps all in need and especially aids those seeking perfection in order to find the means of surmounting their difficulties. From the third stream flow love and light for the benefit of his friends who have attained perfection; these he wishes to unit to himself so that they may share his knowledge and commandments and, in their individual ways, devote themselves wholly to advancing his glory."